Students from the various schools at Monash South Africa in Ruimsig Johannesburg are involved in a very stiff competition to outdo each other in doing well in their communities. 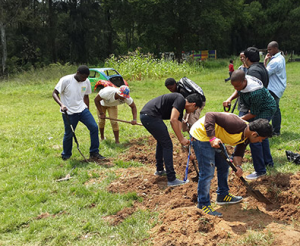 The Here for Good project puts students from various faculties within Monash against each other to see who will spend the most hours doing volunteer and community work with communities in Cosmo City, Muldersdrift and Kromdraai. Craig Rowe, head of Community Engagement at Monash says that the Here for Good launch in February was held during Orientation Week as the first of a series of monthly competitions that will culminate in a grand finale at the end of the year. During this time a total of 1281 volunteer hours were completed and the winning school was Business and Economics which recorded a total of 492 hours. Students dug trenches to divert water away from school facilities, they helped distribute new school uniforms for each child in one school and initiated a project to audit text books at another as well as cleaning and picking up rubbish. “Here for Good fits in very well with our existing volunteering and community engagement projects which have always played a very important role in Monash student life,” says Craig. He explains that Monash South Africa community engagement supports student participation in programmes such as volunteer placements, service learning initiatives and Monash student and staff volunteer organisations. Craig believes that the project benefits the students as they learn from the communities as much as the communities benefit from the student work. Monash is committed to leading by example, and volunteering is encouraged amongst students as well as staff.